Enrollment has been extended to Oct. 15! National PTA invites you toenroll this school year to demonstrate your continued commitment to building strong family-school partnerships and positively impacting your whole school community. Enroll today at PTA.org/Excellence. Then join our webinar Wed., Oct. 26 at 2 p.m. EDT, to help you get started on the path to excellence. We’ll dive deeper into the National Standards for Family-School Partnerships. Guest speakers include School of Excellence award recipients will share how their PTA and school achieved excellence status. The resolutions committee is seeking resolutions for consideration during the 2017 National Convention in Las Vegas. All resolutions packets must be RECEIVED electronically atResolutions@PTA.org by 11:59 p.m. EDT, Nov. 1. See our checklist for detailed submission guidelines. Resolutions received after the deadline will not be presented at the 2017 National Convention. Early submission is encouraged. If parts of the resolution or background information are missing, or if edits are necessary, the submitter will need to work with a committee member to ensure the final submission is completed by the deadline date. Fax and hard copy submissions will not be accepted. For more info, see our PTA Resolutions Toolkit. Become a National PTA Leader! The Nominating and Leadership Development Committee (NLDC) is seeking candidates to stand for election in June 2017 for several national leadership positions. NLDC is accepting Letter of Interest Applications submitted online until 11:59 p.m. PDT (3 a.m. EDT), Sat., Oct. 1. We strongly recommend you submit your application early. Watch the recording of our webinar on the new online application process! If you have questions, please contact the NLDC at LeadershipDevelopment@PTA.org or (703) 518-1251. These webinars were pre-recorded. Watch them on National PTA’s YouTube. Join National PTA’s Government Affairs team on Wednesday, Oct. 5 at 3 p.m. EDT for a webinar that will guide participants through the federal appropriations process with updates on the funding levels for education programs.Register now! Join National PTA on March 7-9, 2017 in Arlington, Va., for the 2017 National PTA Legislative Conference (LegCon). The conference will feature new content and trainings to provide PTA advocates with the latest skills to shape public policy. National PTA e-Learning offers new micro-courses designed toexplain specific topics in just 8-12 minutes. Looking to find out more about 501(c)(3) requirements? Take the Quick Guide to 501(c)(3) Basics Course! Are you looking to help support local unit secretaries with specific training on how to record minutes properly? Take the Quick Guide to Taking and Approving Meeting Minutes! If you are looking for more information regarding all of National PTA’s e-Learning courses, visit our Facebook page to see our most recent PTA Live with e-Learning Manager Jonathan Baker. 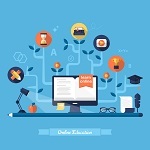 He covers a wide range of e-Learning topics from translated Spanish courses to why using e-Learning as a tool for your Local Units is most important during Back-to-School! Are you or someone you know a federal employee, member of the military or a federal contractor? 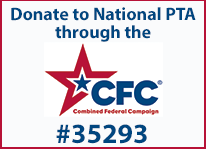 If so, please choose National PTA as your charity of choice for your federal workplace giving campaign! Actor Rob Lowe helped launch the Crest Healthier Smiles Project in NYC on Sept. 26. Crest is partnering with the National PTA on an education program and working with Feeding America to donate hundreds of thousands of tubes of toothpaste to those who need it most. Is Your Child on Pace for Math Success? Time for a math checkup! Can your child answer Mathnasium’s grade-level mental math questions? The results may surprise you. Whether students are ahead of the curve, performing at grade level, or falling behind, Mathnasium is here to help them reach their math goals. Find your neighborhood math experts to get started! More than 38 million school days each year are missed due to influenza alone, while tens of millions more are lost due to colds and other infectious diseases. To help reduce absenteeism in schools, Lysol has partnered with the National PTA and NEA (National Education Association) to develop the Healthy Habits Program, which provides customizable lesson plans, activity calendars and tips for parents and teachers on how to help keep kids healthy. Learn more today! When Rembrandt was learning to paint, he greatly benefited from the training and leadership of mentors who led him along the path to becoming a master artist. The Park West Foundation, the nonprofit arm of Park West Gallery, supported National PTA during National Arts in Education Week. 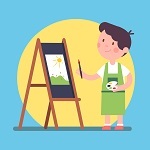 Without Local Leaders emphasizing art education, the world would become a dimmer place. Learn more about Park West’s mission at parkwestgallery.com. Disclosure: This e-newsletter contains sponsored content from third parties. National PTA does not endorse any commercial entity, product or service.